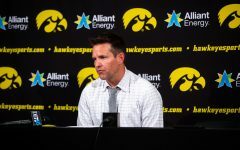 The Hawkeyes hope to take control of their own destiny and fight for a spot in the Big Ten Tournament against Minnesota. 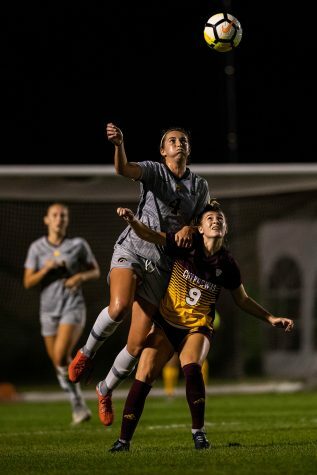 Hawkeye junior Hannah Drkulec jumps for the ball during the Iowa and Michigan State match at the UI Soccer Complex on Friday Oct. 12, 2018. 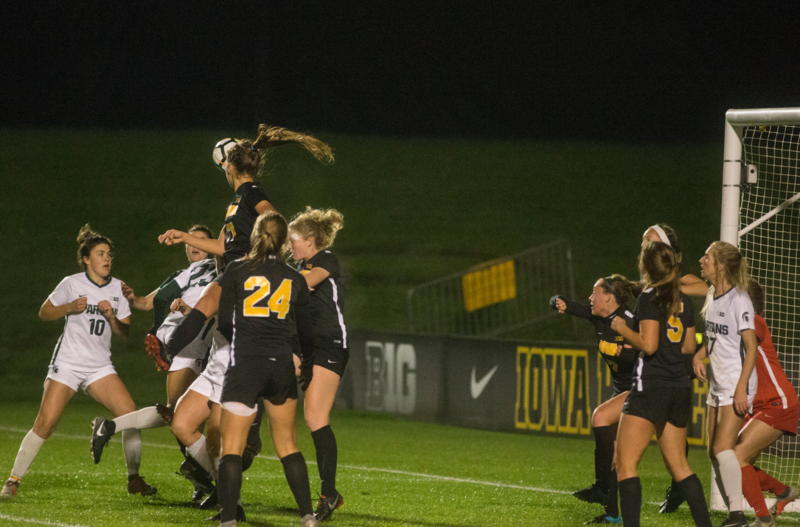 The Hawkeyes defeated the Spartans 1-0. 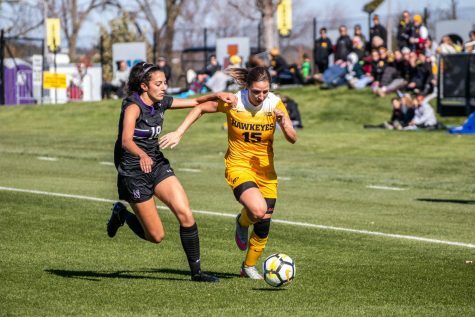 There are only two games left of the regular season for the Iowa soccer team: major Big Ten opponents Minnesota and Northwestern. 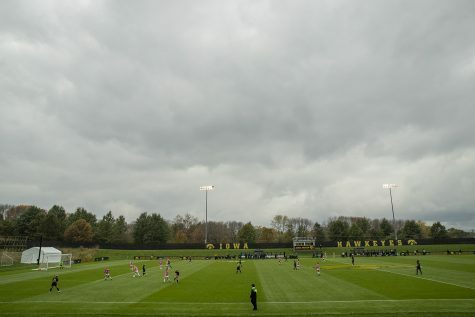 Iowa will travel to Minneapolis for the last road trip of the regular season to play the Gophers today at Elizabeth Lyle Robbie Stadium. The game will ultimately be the tiebreaker for both teams. 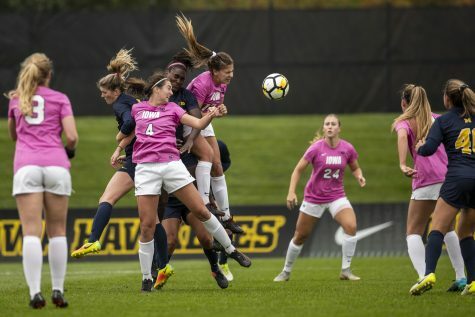 Iowa and Minnesota are tied for seventh in the Big Ten; the Big Ten Tournament takes the top eight teams. 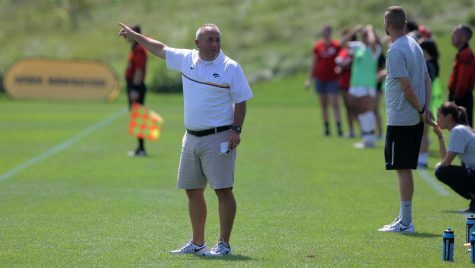 “[This game] is what you play the whole year for, to give yourself a chance that these games are actually of value and matter,” head coach Dave DiIanni said. He likes his approach and would rather his squad focus on the details that have led the team to success in the previous weeks. The past two weeks have been the team’s best this season. 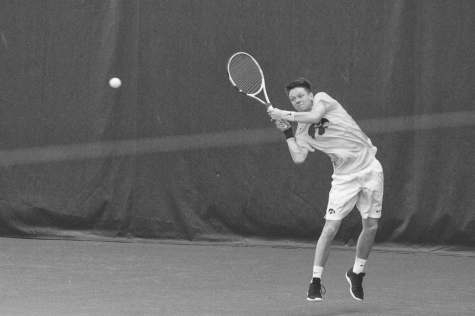 The Hawkeyes recorded two shutout wins over Michigan State and Michigan to extend their winning streak to three matches. 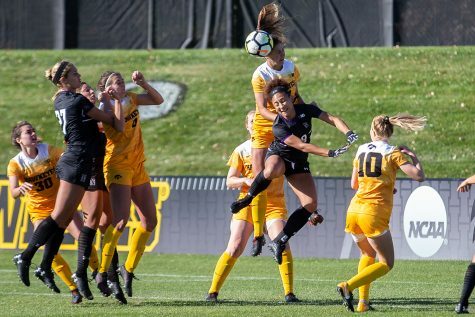 To top it off, senior Morgan Kemerling won Big Ten Defensive Player of the Week after her stellar performance against the Spartans and the Wolverines. Kemerling played a full game against Michigan and led the backline in holding the Wolverines to zero shots on goal. Now, the goal is to take all of this momentum and success and put it to use against the Gophers. 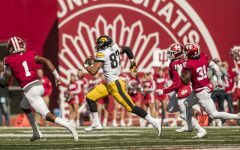 Iowa is 4-12-4 all-time against Minnesota. But the Hawkeyes will not let that get in the way. DiIanni and his squad are ready to go the road against a tough Gopher team. Iowa may be 1-6 on the road, but the team is confident. The win against No. 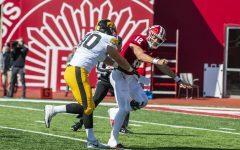 22 Nebraska (2-1) was the first ever against the Huskers in Hawkeye history. 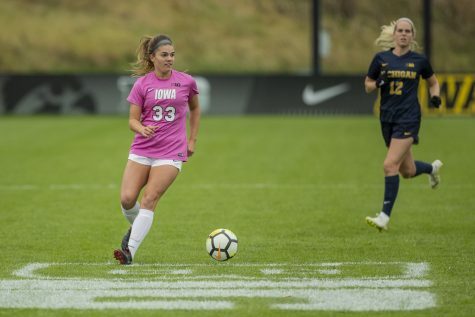 But with two games left, it comes down to which team can follow through, and the Hawkeyes know that it is on them to continue its success.